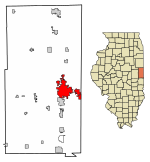 Danville is a city in and the county seat of Vermilion County, Illinois, United States. As of the 2010 census, its population was 33,027. Location of Danville in Vermilion County, Illinois. Danville was founded in 1827 on 60 acres (240,000 m2) of land donated by Guy W. Smith and 20 acres (81,000 m2) donated by Dan W. Beckwith. The sale of lots was set for April 10, 1827 and advertised in newspapers in Indianapolis, Indiana and the state capital of Vandalia. The first post office was established in May of the same year in the house of Amos Williams, organizer of Vermilion and Edgar Counties and a prominent Danville citizen. Williams and Beckwith drew up the first plat map; the city was named after Dan Beckwith at Williams' suggestion, although Beckwith suggested the names "Williamsburg" and "Williamstown". Beckwith was born in Pennsylvania in 1795 and moved to Indiana as a young man; in 1819 he accompanied the first white explorers to the area where Danville later existed because of his interest in the salt springs of the Vermilion River. He died in 1835 of pneumonia contracted on a horseback ride back from Washington; he was 40 years old. Danville became a major industrial city in the late 19th and early twentieth centuries. From the 1850s to the 1940s, Danville was an important coal mining area; some of the first open pit mining techniques were practiced here. The coal formation underlying eastern Illinois and western Indiana is named the "Danville Member," after the area where it was first discovered. With the closure of the mines and many factories, Danville's economic base suffered in the latter half of the 20th century. The former mines were converted into lakes, creating fishing and recreation opportunities at parks such as Kickapoo State Recreation Area and Kennekuk Cove County Park. 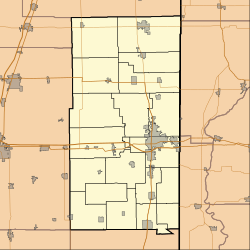 Danville is located approximately 120 miles (190 km) south of Chicago, 35 miles (56 km) east of Champaign-Urbana, and 90 miles (140 km) west of Indianapolis, Indiana. Illinois Route 1, U.S. Route 136, and U.S. Route 150 intersect in Danville; Interstate 74 passes through the south end of town. Lake Vermilion is located on the northwest side of town. According to the 2010 census, Danville has a total area of 17.967 square miles (46.53 km2), of which 17.89 square miles (46.33 km2) (or 99.57%) is land and 0.077 square miles (0.20 km2) (or 0.43%) is water. In recent years, average temperatures in Danville have ranged from a low of 17 °F (−8 °C) in January to a high of 86 °F (30 °C) in July, although a record low of −26 °F (−32 °C) was recorded in January 1994 and a record high of 112 °F (44 °C) was recorded in July 1936. Average monthly precipitation ranged from 1.99 inches (51 mm) inches in February to 4.70 inches (119 mm) inches in June. Danville is the principal city of the Danville Metropolitan Statistical Area, which encompasses all of Danville and Vermilion County. As of the census of 2000, there were 33,904 people, 13,327 households, and 8,156 families residing in the city. The population density was 1,994.0 people per square mile (770.0/km²). There were 14,886 housing units at an average density of 875.5 per square mile (338.1/km²). The racial makeup of the city was 70.19% White, 24.37% African American, 0.21% Native American, 1.20% Asian, 0.03% Pacific Islander, 2.09% from other races, and 1.92% from two or more races. Hispanic or Latino of any race were 4.57% of the population. There were 13,327 households out of which 28% had children under the age of 18 living with them, 42.0% were married couples living together, 15.1% had a female householder with no husband present, and 38.8% were non-families. 33.9% of all households were made up of individuals and 15.5% had someone living alone who was 65 years of age or older. The average household size was 2.35 and the average family size was 3.01. In the city, the population was spread out with 24.9% under the age of 18, 9.5% from 18 to 24, 27.7% from 25 to 44, 21.3% from 45 to 64, and 16.6% who were 65 years of age or older. The median age was 37 years. For every 100 females, there were 99.3 males. For every 100 females age 18 and over, there were 97.7 males. The median income for a household in the city is $30,431, and the median income for a family is $39,308. Males have a median income of $31,027 versus $22,303 for females. The per capita income for the city is $16,476. 18.1% of the population and 13.4% of families are below the poverty line. Out of the total people living in poverty, 26.8% are under the age of 18 and 10.5% are 65 or older. According to the United States Bureau of Economic Analysis, Danville is the cheapest place to live in the United States. The city of Danville maintains 20+ parks and recreation facilities, from small pocket parks to large regionally significant parklands. Danville's parks contribute to a county-wide collection that includes four county parks and three state parks. When combined with the city parkland, these total more than 15,000 acres, providing more acres of public park per capita than in any other county in Illinois. Danville sits along the shore of Lake Vermilion, which is a 1,000-acre reservoir. The lake allows for fishing, bird watching, and unlimited-horsepower marine boating, jet-skiing, and waterskiing. Danville also sits along the Vermilion River, which provides recreational opportunities and supports abundant wildlife. There are several notable parks within the city, including Lincoln Park, home of mature trees, tennis courts, and the Abraham Lincoln–associated Lamon House (a Greek Revival cottage built in 1850 by Joseph and Melissa Beckwith Lamon). On the west side of the city, the North Fork of the Vermilion River winds through Harrison Park Golf Course, providing a backdrop for the 235-acre golf course and hiking destination. On the north side, the Heron County Park Wetlands Boardwalk extends into Lake Vermilion and includes a 950-foot handicapped-accessible floating boardwalk that weaves through the marshland. The park also contains a 30-foot observation tower, which often provides views of bald eagles and American egrets. The downtown district contains five pocket parks, including Lindley Sign Forest and Temple Plaza. Temple Plaza hosts a number of community events throughout the year; including a summer concert series and a brick relief sculpture created by Texas-based artist Donna Dobberfuhl. Additional recreational opportunities exist throughout the community, including Fetch Dog Park, the Danville Dans collegiate summer league baseball team, the Danville Dashers of the Federal Hockey League, and many community sports leagues. Danville's main shopping center is the Village Mall, opened in 1975. Additional retail has spread north on Route 1/Vermilion Street since the early 90s, ranging from traditional big-box stores and retail infill and redevelopment of abandoned shopping centers. Retail in the community has increased after a large influx of redevelopment and green development happened in 2013 with the addition of Meijer and the Kohl's Plaza. 2018-present: Rickey Williams Jr., appointed Acting Mayor by the city council, following Eisenhauer’s resignation. Elected to full term on April 2, 2019. Defeated Former Vermilion County Board Chairman James McMahon, Alderman Steve Nichols, and Donald Crews. The City of Danville website maintains the complete list of mayors from 1867 to present. The general aviation community is served by the Vermilion Regional Airport. Danville is known as a major railroad intersection with at least four different tracks entering town from different directions, resulting in many crossings throughout the town. CSX Transportation, Norfolk Southern Railway, and Kankakee, Beaverville and Southern Railroad all operate rail lines that pass through Danville. Danville Mass Transit (DMT) operates 14 fixed route buses in Danville and surrounding areas. ^ a b Stapp, Katherine; W. I. Bowman (1968). History Under Our Feet: The Story of Vermilion County, Illinois. Danville, Illinois: Interstate Printers and Publishers, Inc. pp. 54–55. ^ a b "2010 City Population and Housing Occupancy Status". U.S. Census Bureau. Archived from the original on July 21, 2011. Retrieved May 14, 2012. ^ Jones, Lottie (1911). History of Vermilion County, Illinois. Chicago: Pioneer Publishing Company. p. 89. ^ Wright, Bob (1987). Danville: A Pictorial History. St. Louis, Missouri: G. Bradley Publishing, Inc. p. 8. ISBN 0-943963-01-X. ^ "Kickapoo - State Recreation Area". Illinois Department of Natural Resources. Archived from the original on 2010-11-02. Retrieved 2007-10-20. ^ "Danville coal member". Indiana Geological Survey. Retrieved 2007-10-20. ^ a b "Monthly Averages for Danville, Illinois". The Weather Channel. Retrieved 2011-01-27. ^ "Danville, Ill. the cheapest place to live in the U.S." Chicago Tribune. Retrieved 2014-05-29. ^ "Parks". City of Danville, Illinois. Retrieved 2019-04-15. ^ "Parks & Recreation | Vermilion Advantage". www.vermilionadvantage.com. Retrieved 2019-04-15. ^ "Lake Vermilion County Park – Vermilion County Conservation District". Retrieved 2019-04-15. ^ IL 61834, 2607 Denmark Road Danville. "Lake Vermillion County Park". Enjoy Illinois. Retrieved 2019-04-15. ^ "Vermilion River". www.ifishillinois.org. Retrieved 2019-04-15. ^ IL 61832, 1031 N. Logan Ave Danville. "Lamon House". Enjoy Illinois. Retrieved 2019-04-15. ^ "Harrison Park Golf Course | Danville, IL". www.harrisonparkgolfcourse.com. Retrieved 2019-04-15. ^ "Heron County Park Wetlands Boardwalk | Danville Area Convention and Visitors' Bureau". Retrieved 2019-04-15. ^ "DanvilleUSA©". www.sculpturaldesigns.com. Retrieved 2019-04-15. ^ Brian Huchel (2004-08-22). "Former Danville mayor dies". Commercial-News. Archived from the original on 2007-09-28. Retrieved 2009-10-28. ^ Jennifer Weakley (2002-05-14). "Mayor's secretary retires". Commercial-News. Archived from the original on 2007-09-28. Retrieved 2009-10-28. ^ "Mayoral History". City of Danville, Illinois. Archived from the original on 2011-07-22. Retrieved 2009-10-28. ^ "Illinois Railroad Map" (PDF). Illinois Department of Transportation. January 2006. Retrieved 2007-09-23. ^ "About DMT". Danville Mass Transit. June 2015. Retrieved 2015-06-03. 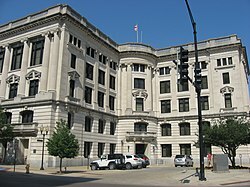 Wikimedia Commons has media related to Danville, Illinois.